About time you made the kammback a permanent blackfly fixture! Also, please keep the prototype cardboard template pieces. I can't tell you how much I wish, someone would fabricate good templates and sell them to the rest of us who wish we could just "bolt-on" these mods to our cars. I for one would be happy to pay for a kammback template or kit . I will watch your progress with great interest! Nice looking rear wheel skirts. What are you using for fasteners behind the the skirt. Are those pop rivits? Or are they scews and if so what are they screwed into. Do you have a mpg benefit that you have tested. That 2.5:1 teardrop can serve you as a template for a proper roofline profile. Your CRX is the closest example of following the shape. 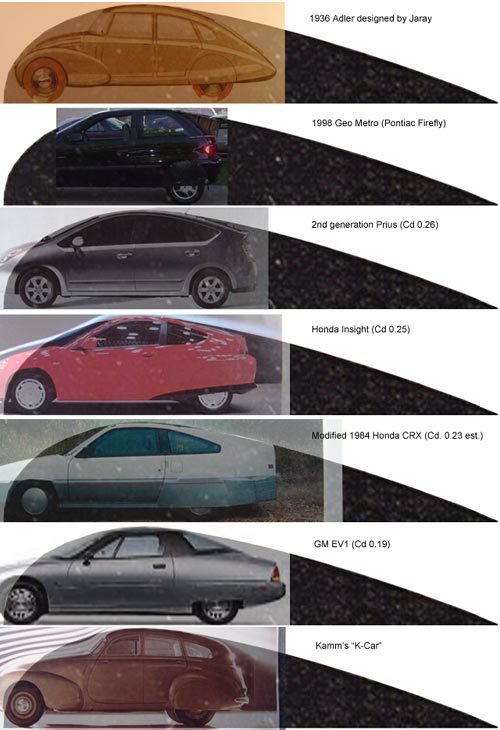 Most surprisingly, the excellent GM EV1 is the furthest from the "ideal" profile! And for my design, it's not perfect. It's not very clear from this picture, but there's a diverging gap between the cardboard and the teardrop "outline" roughly comparable to the Prius & Insight examples. I'd still like to tuft test it before raising it up though. No verdict. I've seen conflicting data suggesting both open and closed styles are best . Oh, that sounds cool. Time frame: finish & tuft test the current profile this weekend. Then decide if it the angle needs to be eased back. Then start fabricating. Cd - I also prefer the look of the car with the kammback extension. As for the neighbours, they're not really the mocking types. Not because of gas prices, but they're used to me doing strange things to cars by now. Also, please keep the prototype cardboard template pieces. I may end up glassing the cardboard into the structure. Haven't decided yet. But at the very least, I can make a tracing pattern of the final product that you could use as a template. Based on how I interpreted your tear-drop, do you think the "red line" I am showing in the above picture is close to the ideal slope for my car? Yup. Assuming we're working with the right tear drop as a starting point, that looks good. I can't believe I forgot to do the aerocivic. I'm not sure if I've done it right - matching the highest point of the car's roofline to the widest (tallest) point of the teardrop puts some of the rest of the car's silhouette outside the teardrop boundary. Not sure what the implications are. If possible, can you post any images/video of the tuft tests ? I'm sure everyone here at this site would find it useful.